Jewels Aguirre confirmed for Rocky Mountain Collector Con! Here's a great opportunity for all you American NiGHTS fans to meet the lady behind the official voice of NiGHTS in Journey of Dreams! The wonderful and multi-talented Jewels Aguirre has been confirmed as a special guest at RMCC this coming October in Colorado. Jewels will be doing signings and would really love to meet the NiGHTS fans. This is her first convention appearance so lets give her lots of support! Tell all your NiGHTSy friends who live local to the convention or hit the road yourself I really wish I could go but I'm stuck in the UK, booo. The Rocky Mountain Collector Con runs over the course of 3 days from October 4th to the 6th. Tickets are available to purchase online at the convention website. To learn more about Jewels' impressive portfolio of work check out her guest page on the RMCC website. You can also connect by showing her support on her official Facebook page. SEGA officially announce the Deadly Six Bonus Edition – more details!! 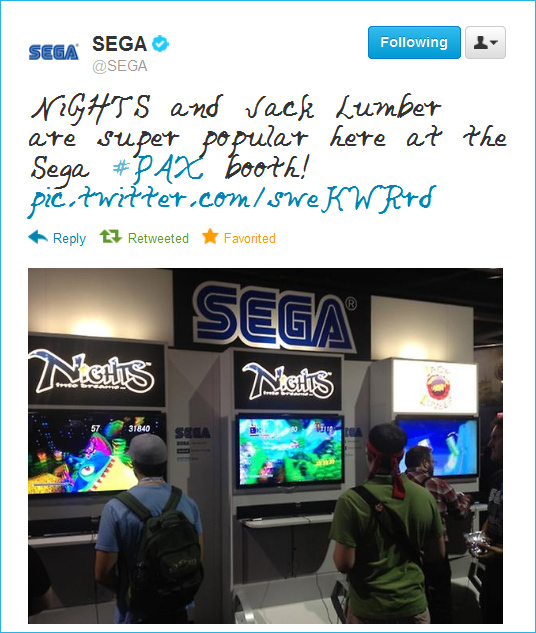 SEGA updated the blogs a few seconds ago with awesome details on the NiGHTS news from yesterday! It seems to confirm being available in all the usual regions Good news for you fans not in the UK. Read on for the official blurb and pretty pretty screenshots of our favourite Marens! I'll update with links to places you can preorder this special version as I find them to save you guys missing out. It’s Sonic’s worst NiGHTMARE! 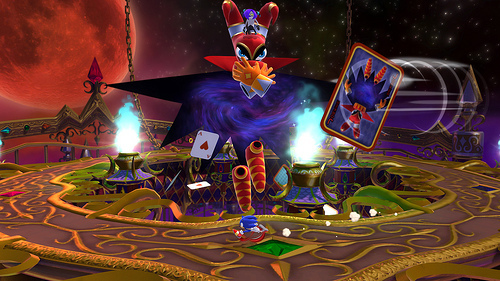 Sonic has been sucked into a world of nightmares created by Wizeman, and must defeat the Deadly Six, who are riding on gigantic Nightmaren monsters inspired from the game NiGHTS into Dreams… . This exclusive level is accessed via a redeemable code when pre-ordering the game, or while supplies last. The NiGHTMARE DLC can be played at any point in the game and when the level is completed, a special Color Power (usually only obtainable from Miiverse) is rewarded to the player. 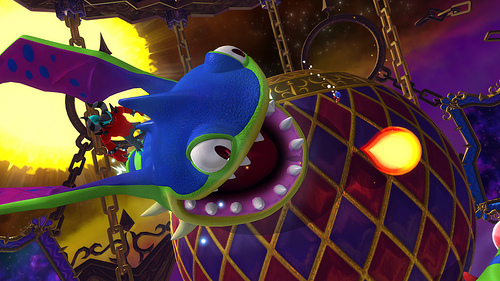 Pre-order the Deadly Six Bonus Edition (called the Deadly Six Edition in Europe) of Sonic Lost World today! Hey PC-owning peoples it's that day you've been waiting for! NiGHTS into Dreams is now available to buy on Steam ^^ Check out the [ official SEGA blog ] for full details. I'd like to thank all of you for making this little dream come true. The awesome Mr. Pete Nethercote (a.k.a TitansCreed on Twitter), has interviewed TRiPPY and myself for his Community Spotlight show. The 30 minute chat has us talking about NiGHTSy things, from the campaigns and their success to NiGHTS: Lucid Dreaming and how the fans keep going after so many years. It is a nice little interview with plenty of personal short visits down memory lane. So, have a listen and be sure to check out Pete's Community Spotlight twitter account @TCSpotlight for updates on future interviews. Thanks again to The Community Spotlight for having us on. The collective power of ultimate win. So, I was at a Sonic convention this weekend here in the UK. Summer Of Sonic 2012. You might have heard of it? Of course you have. Our good friends SUMO Digital were there. A funny thing happened. Usually, with the SUMO's you're always going to have some funny thing happen but this particular thing turned out to be a BIG fantastic NiGHTS reveal for Sonic & AllStars Racing Transformed! And, for the sake of keeping things in line, while this reveal was at a SEGA related event it has not been officially announced by SEGA themselves online so this news post is more along the lines of our take on the reveal rather than posting images and videos from it. Once the announcement has been made through official SEGA channels you can bet we'll be posting ALL THE THINGS here. Well, Steve Lycett and Tim Spencer from SUMO Digital were on stage doing their Question & Answer session. It was roughly a 30 minute stage session where SUMO Digital answered some questions about their new upcoming and quite frankly Miller Ball Breakingly awesome racing game 'Sonic & AllStars Racing Transformed'. Towards the end, Tim turns to Steve and proclaims "Steve, isn't there someone we've forgotten?" Mr. Lycett says he doesn't think so, though Tim is insistent that he has. People from the crowd begin calling certain characters though NiGHTS is a name you hear prominently. The lights dim, the TV's start rolling – and familiar but modern NiGHTS into Dreams… music begins to play. A lush green valley appears with a ceiling of fields and trees suspended upside down. An Egg Clock floats by. 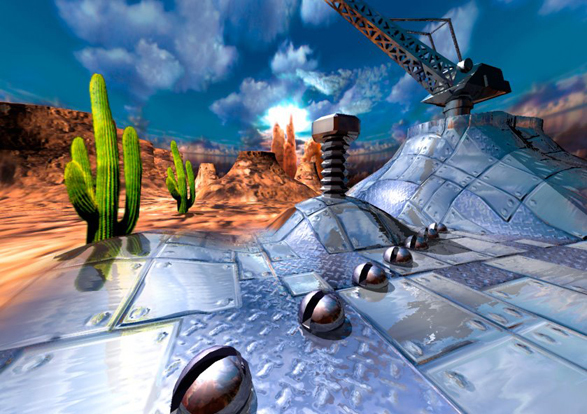 Screen transitions to another area of the location, a Kircle hovers past with it's pincers snapping away before we transition to a floating windmill, a giant Shleep, rock formations moving and changing, and then finally a Dream Gate with an open swirling vortex inviting you to jump in to the unknown. Music switches up tempo to a tune we recognize as Spring Valley's theme. 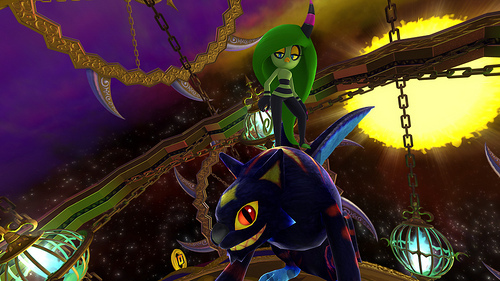 NiGHTS appears in an airplane shape, soaring through the skies of Spring Valley, accompanied by a Nightopian clinging on to his back. A few quick barrel rolls and tricks through the link rings located around the level before we transition to another character…. 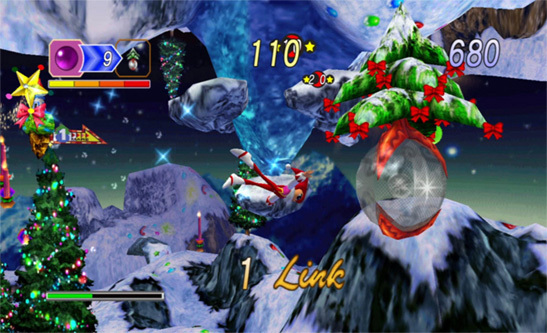 Reala flies by, also in an airplane mode, being driven by a Nightmaren Goodle pilot who appeared in 'Journey of Dreams'. Throughout NiGHTS' first appearance the crowd cheered, only to be followed by a second cheer when Reala showed up. I turn to look at the stage and yell at Steve Lycett that he is a 'beautiful BEAUTIFUL man' before i turn back to the screen and we all see NiGHTS fly through one of the Dream Gates. Location change, welcome to Nightmare. You are now in Gillwing's lair, flying through the undergrowth at the base of the Maren's level. Pastel coloured plants litter the ground while green particles of pollen float in the air. Gillwing flies overhead in an awesome show of dominance over his land before we find ourselves flying through a Dream Gate at the end of the trench. We are back in Spring Valley, this time at the top of the snow capped mountains. NiGHTS is now in boat formation, racing through a river at high-speeds, an Ideya Capture hovers, moving from side to side above the rushing water. Transition to Reala who, also in boat formation, does a quick flip after driving over the edge of a small waterfall, the Goodle pilot on his back straightening his hat just before Reala does so. Cut back to NiGHTS flying through another Dream Gate and suddenly the ambience shifts and the mood lighting is darker, more ominous. The lord of Nightmares comes in to view in the distance. Wizeman. The crowd behind me erupts in a cheer of supportive praise. NiGHTS races towards his creator and Wizeman begins flying back making the jester chase him. Rocks hurtle towards NiGHTS, who's barrel rolling to dodge the incoming attacks. We fly through one last Dream Gate at the end of the battle arena before the title logo transitions into view. 'Sonic & AllStars Racing Transformed'. Remember that title. Remember that logo. And remember this. In the years we have campaigned to keep NiGHTS active I don't think anybody has acknowledged us on the scale that perhaps SUMO Digital have. Year one on the campaigns, they came to our forums even after the trouble we caused them and they spoke to us. 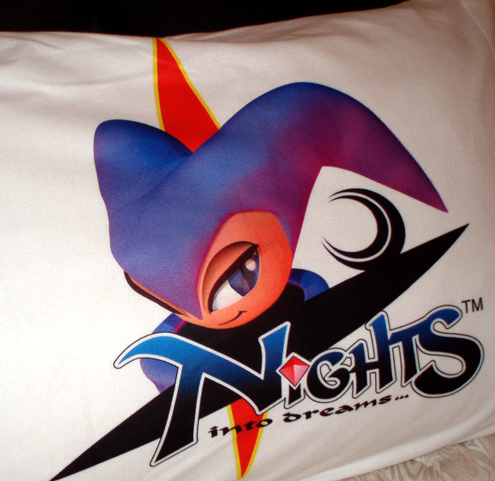 They knew that even with our campaign backing it there just wasn't any time at all to put NiGHTS as a playable character in the first AllStars game. They did what they could though so they gave NiGHTS the one thing he's been known to do in Sonic games for many years now and gave him a cameo as the Flagwaver. We were thankful for that. I know that late in development, to start adding new things to a game is very risky and what SUMO had technically done was include a brand new bit of code into every single level. I can only imagine the problems that arose from doing just that. But you know what? While bits of the internet complained, NiGHTS fans were thankful to be represented. It was not what we asked for but we were seriously happy. NiGHTS was not forgotten, even if only for a little while longer. After that though i thought that was it. SUMO Digital, however? Nope, it seems they weren't quite done with NiGHTS. They were making this sequel and they were going to have NiGHTS playable. And Reala too. And they were going to give the characters a race track made out of one of their game's levels. And that track was going to have areas accessible to other areas where cameo's of other characters from NiGHTS would appear. When you look at what our campaign asked for three years ago and hold it up to what we've been given today, the amount of sheer and utter love for NiGHTS from SUMO is unreal. More than we asked for? Understatement! For whatever stupid reasons NiGHTS was not in the roster for the first AllStars Racing have been annihilated by this point, and by SUMO's complete dedication to making sure we are represented as much as we possibly can this time around. They knew we were here and they didn't forget NiGHTS. Please make sure you say thank you to them. It's the least we can do. We did it guys! NiGHTS into dreams… ports into reality! Can I be honest? This is a post I'd been wanting and waiting to have to type up for many many years. Now that it's actually here I'm probably too happy and tearful to be able to word it properly. Today marks 16 years since the release of the original NiGHTS into dreams… on the SEGA Saturn. Today marks the day that SEGA answered our dreams and the NiD15 campaign. 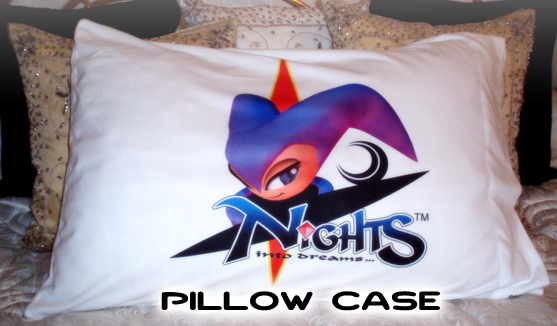 Guys… NiGHTS into dreams… is being ported to modern consoles. We've finally got what we'd been begging for. A new generation of NiGHTS fans will now be able to experience what we love so much. Old fans will be able to play the game now for new reasons. And everyone else? Well welcome to something beautiful and life changing that will stick with you for a very very long time. SEGA have been directly working with the fans on this one. We've been working on the game. This is the real deal. This was the one title that caused me to chase my dreams for years to work at SEGA. It's with a great sense of pride I can say I achieved that dream years later. The day I sat down infront of this project at my desk I just couldn't stop smiling. I knew this entire community was perched up on my shoulder. This has been a real dream come true. For all of us. Thank you so much to EVERYONE who worked so hard to make this happen. The years of campaigning and promoting, causing mischief and creating the best kinds of memories. You should all feel very proud of yourselves and thankful to everyone behind the scenes. If you believe in something enough, face your fears and never give up – it can happen. Happy birthday NiGHTS. We didn't forget you. Thank you SEGA for listening to us. Please keep supporting NiGHTS, he means a lot to all of us. Dreamers, it's time to wake up again.